E. Nesbit, storyteller extraordinaire, weaves quite a yarn. The Book of Beasts is a favorite of my three sons. Why? Not because the protagonist is a small boy, but because that small boy becomes king! What boy doesn’t dream of being king at one point or another during childhood? But the adventure for Lionel does not begin at the coronation. No, the adventure begins in the library when Lionel dares to open a book. And while the lesson can easily be accomplished without E. Nesbit’s book, it’s the spark for the lesson in the first place and highly recommended. We generated our list below the Latin——greed, laziness, gossip, gluttony. After we were sufficiently steeped in considering the flaws of our flesh, we began a discussion of what shape these “fleshly foes” might take. We started with thumbnail metaphors. Each child began sketching his or her mythical beast, animating its beastly qualities. From here we began to write the Beast Tale. They were to describe the character of their beast in detail, to create a situation in which the beast might feed, and, of course, they were instructed to concoct a way to slay the beast. All this in 500 words or less! The writers eagerly worked to draft idea to paper. I was amazed by the depth of engagement I witnessed as they crafted minute details about beasts that they encounter in the real world. As drafts were completed I saw pencils released and re-reading begin. I saw little hands making red marks—scritch, scratch—then more re-reading until the stage of polish began. Sufficiently satisfied with the stories, each writer then moved back to the visual realm and began animating their thumbnail beasts to a form that was ready for canvas—light pencil traced with Sharpee was then hand painted with fabric ink. 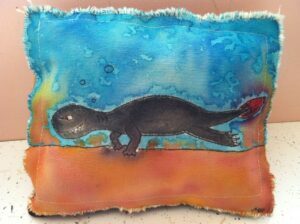 Beasts were hand-stitched to felt and felt was machine stitched to calico. 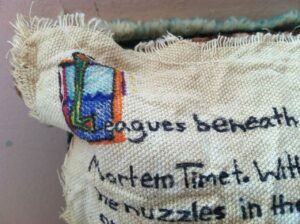 But there was one more piece of fabric to deal with once the visual project was accomplished a few weeks later. And so I asked the apprentices to read, once more, their polished Beast Tales. To their surprise, they stumbled on little errors, or bumps in the story. Everyone found a little something to refine, which proved to them without me lecturing, that writing needs to incubate, that writing is a process. And so, after this final polish, the tales were written by hand on the remaining scrap of canvas. 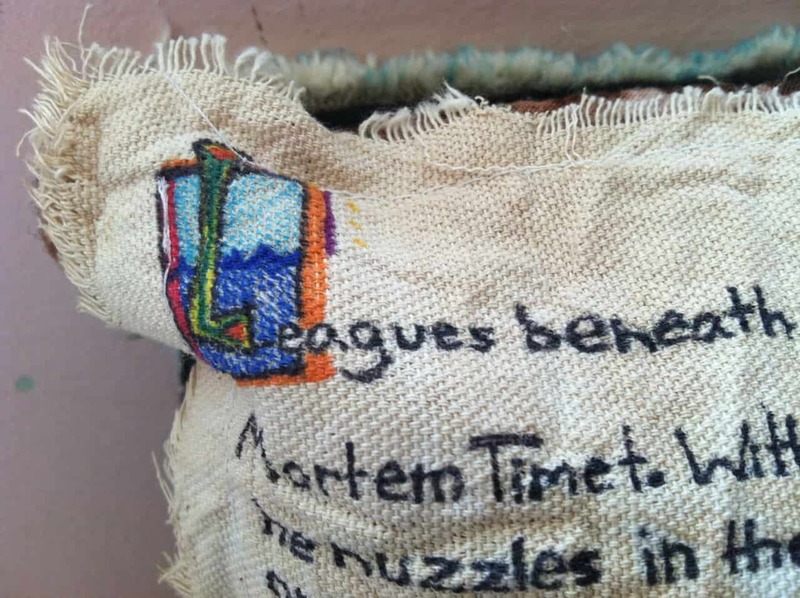 And the stories were machine stitched to felt and the back was stitched to the front and the pillows were stuffed. And that’s how the Beast Tales came to be. When it comes to writing… show don’t tell. So the next time any child grumbles or complains about engaging in the art of writing simply remind them that writing is an adventure, lift an imaginary sword and cry, “Beyond Here be Dragons,” and let the adventure begin. This entry was posted in Art History and tagged art history, creative writing, painting, visual art on January 19, 2014 by WHWPAdmin.